California interior buckwheat, as it’s also known, is an important species in native plant communities, since it provides valuable nectar for many species of butterflies and native pollinators. The creamy white flower heads sway in clusters on long tall stems throughout spring and summer, stamens extending like whiskers from the blossoms offer rosy pollen. The blooms hold on into the fall, transitioning to a rich coffee brown. Small gray green leaves march up the stems and pool at the base of these shrubs; the small size and shape of the leaves allows the buckwheat to conserve water. California interior buckwheat is more of a gray color and more drought tolerant than the other variety of California buckwheat, E. fasciculatum var. foliosum, and is also more cold hardy than other natives, surviving -20 degrees Fahrenheit. 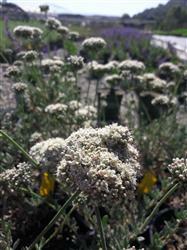 California interior buckwheat grows best with good drainage in full sun, and can reach heights up to about 3 feet. It would be an excellent choice to stabilize a slope, since the buckwheats are excellent at controlling erosion. Try planting it with sage or Woolly Blue Curls at the back of a butterfly garden, and watch the locals fly in!